Meeting with officers and soldiers involved with Israel's equivalent of the U.S. Dept. of Homeland Security to discuss internal (non-border) security operations. Each class of Fellows is expected to prepare a report containing text and pictures describing their activities, with particular emphasis on the field work. Each year, the Foundation posts those reports on this website. VIEW THE REPORTS. "Our trip through the Negev was great. We visited two bases, spoke with several soldiers and discussed security issues with civilians. The Q&A with the Nahal soldiers and the lecture at Bahad 1 were particular highlights." 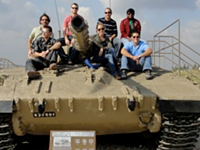 "This site visit was an incredibly valuable experience, as it functioned both to introduce us to key aspects of Israeli military history and to convey many more subtle points concerning the IDF’s priorities and concerns." "Regavim is the training base for one of the most elite forces in the IDF. 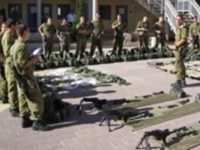 Here we saw Israeli soldiers undergo their weekly gear inspection and were able to see for ourselves their weapons and supplies, including the Tavor assault rifle." Israel’s small size makes intercepting terrorist missile attacks very challenging. Israel’s Iron Dome missile defense system has proven highly effective in intercepting and destroying inbound missiles. It reportedly has a success rate of 90%. Herzliya is an upscale town just north of Tel Aviv along Israel’s Mediterranean coast. The population numbers around 110,000. Heziliya is about 11 miles from Ben Gurion International Airport and about 53 miles from Jerusalem. Israel is about the size of New Jersey. The country measures 263 miles from north to south and 71 miles east to west at its widest point. 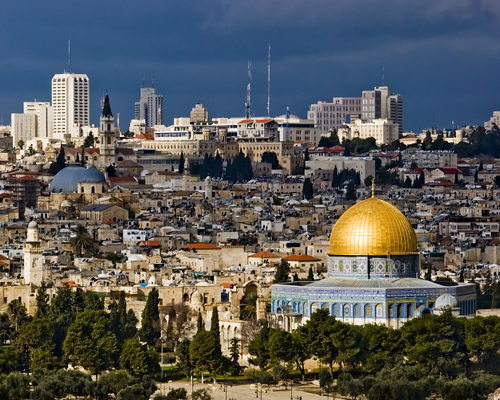 The three main cities are Jerusalem, Tel Aviv, and Haifa. All three are located in the northern half of the country. The main city in the southern half is Beer Sheva. The city at the southern tip of the country is Eilat. The total population is around eight million.